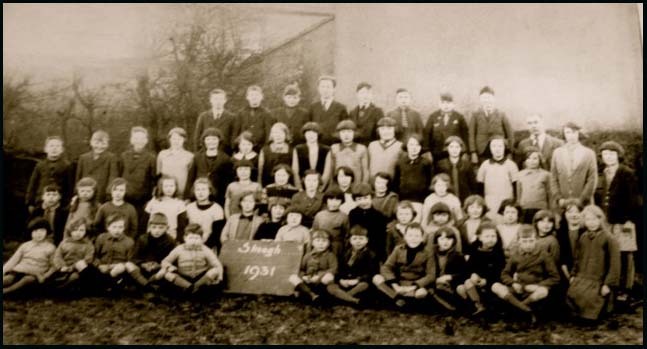 Dunsford National School Dundrum Elementary School 1922 Finnis Primary School c. 1927 & 1931 & 1948 . 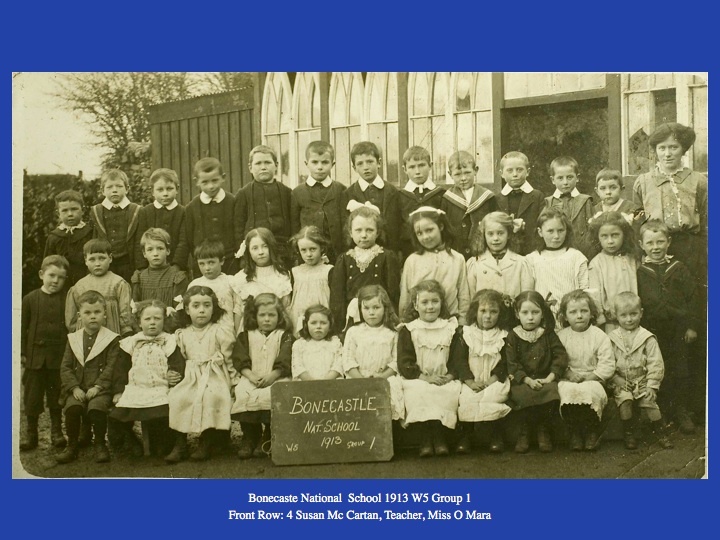 This photo was kindly sent by Brian Lennon whose mother Bridie McGeown ( 2nd front row) helped him transposed the names of the children onto the right photo. This photo was kindly sent by Mark Donald. It shows his mother-in-law, Isobel Lennon . Does anyone know any other names? 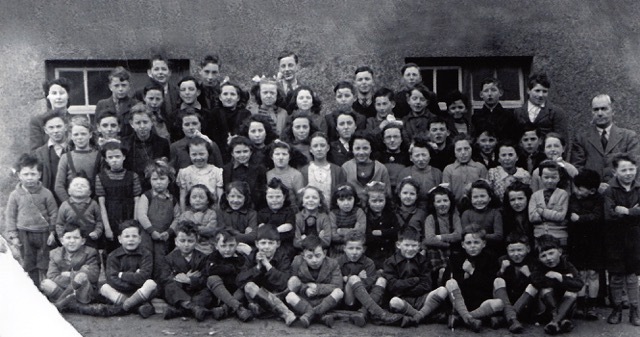 Assumption Grammar School, Ballynahinch, the only Assumption school in Ireland, was founded in 1933 by Mother Baptist McKenny with 20 boarders. 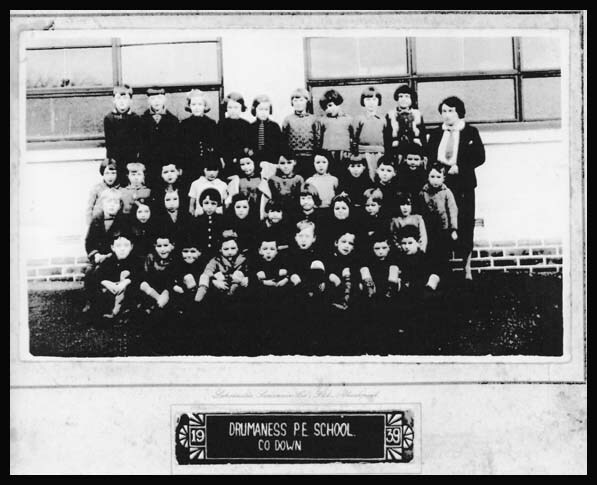 The school prospered and in 1936 was approved by the Ministry of Education. Over the years the school has grown in reputation. Success gained by pupils not only in examinations but also in literary and scientific competitions as well as in public speaking, sport and the arts are regular features of its life. 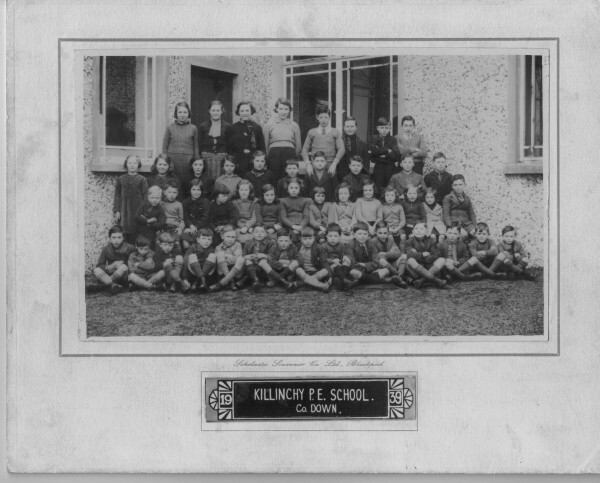 As in all Assumption schools, the pupils in Ballynahinch wear the Assumption Crest on their uniform. The cross on the crest is a symbol of the love of God, which is above everything and holding everything together. The anchor is a symbol of stead fastness, hope and security. The Southern Cross which links our school to its origins in the southern hemisphere (South Africa) , is a symbol of God's guidance and direction in ourlives. 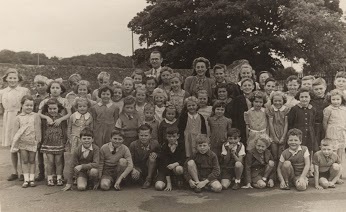 This photo was kindly sent by Calum O'Hare whose mother Veronica (Ronnie) McAlister (Mrs. O'Hare) is in the back row. Also his aunt Eileen O'Hare & cousin Tessie McKay & Anna McKenna and Una Drayne. 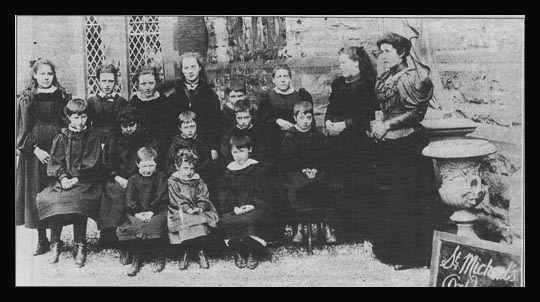 Classes were held in a loft in the Catholic church in 1827 until Father Peter Polin built a school in Railway Street in 1864. 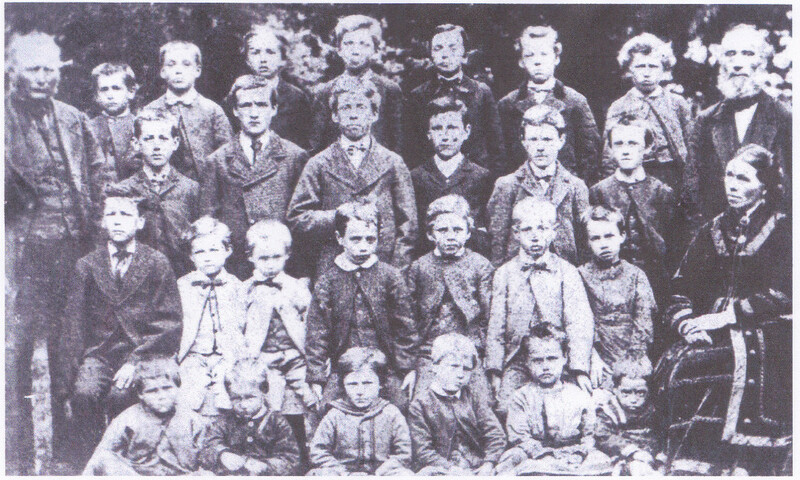 It was under the National School system by 1849. There were 10 boys & 5 girls who paid 4 pence per student (HMP) . 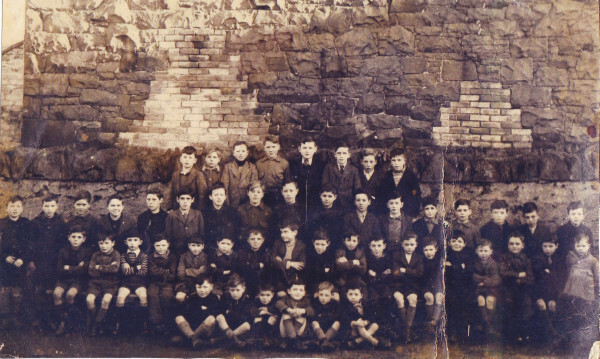 The brick wall shown was part of Paddy McCauley's house . 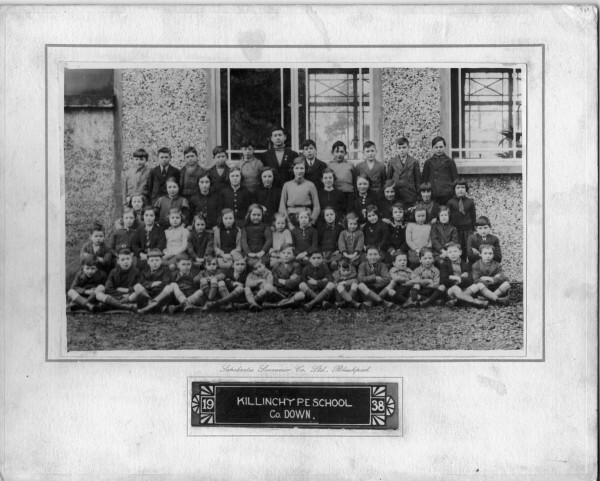 The senior's teacher at the time was Joe Mulholland who had followed Paddy Flynn from Drumaness. Mrs. Hart taught the juniors. These lovely old photos were kindly sent by Daphne Morgan. 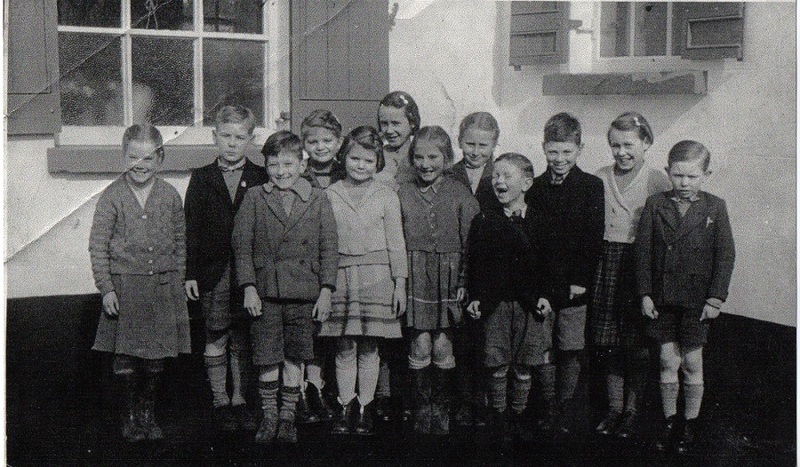 This photo c. 1947 shows Dessie Crossan somewhere. 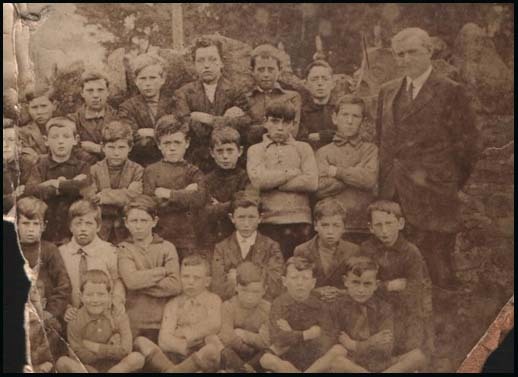 3rd row from bottom L-R; Vincent Hanniweb; in 4th spot is Eddie Miskelly; in 6th spot is Patsy Carville; in 10th spot is Hugh O'Kane; near crease Tommy Morgan & Arthur Morgan & his cousin Terry Morgan next to him & end of row ... Foley & Paddy Hart. Names kindly supplied by Jimmy Hanvey. Any other names please? 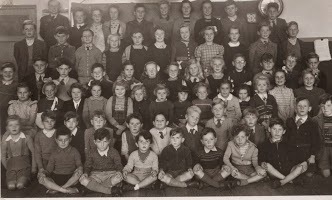 Daphne also sent this class photo from 1953/4. Brian Linden has kindly supplied the names. The principal was Joe Mulholland at that time. 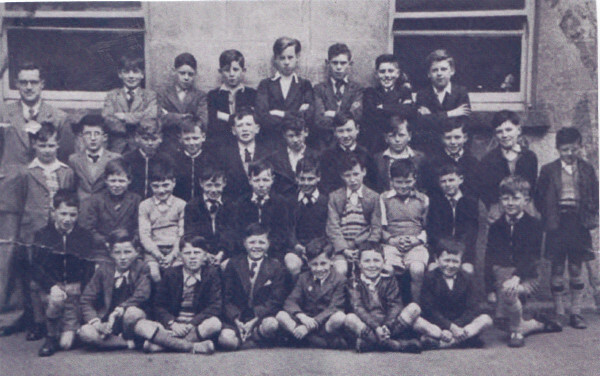 Third Row L-R: John Ralph, Vincent Hannawin, Eddie Miskelly, Jim O'Rourke, Brian Linden. Patsy Carville, Dan Linden, Eamonn McKay, Pat Davy, Hugh O'Kane, Gerald Noade. Front row L-R; Jim Walsh, Dermot McKay, Seamus McGlew, John Galway, Benny Marner, Brendan Foley. Others missing include John Lynn, Sam Taylor, Ronnie Dunwoody and Brian Madine. 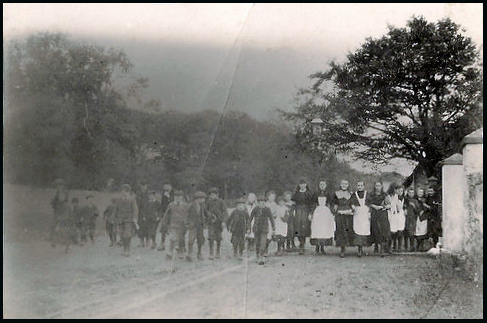 Although the date here is 1910 Alison Denvir (who kindly ent this photp) suspects it was just a little earlier than that. 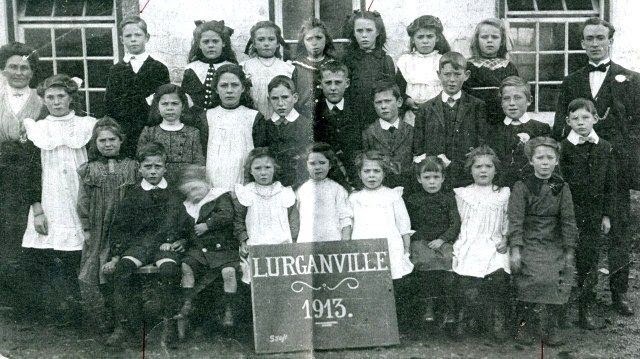 She'd guess 1900 as her great great aunt Lily Mc Cormick is in the back row and her birth date was 1891, she looks about 9 years old here. Maree Devitt kindly sent this photo as it contains her grandfatheer, Robert Moore of Craigantlet who attended 1887-1895 and his younger brother William John Alexander Moore born 23 Jul 1878 & who died 12 Mar 1890 aged TB. Maree doesn't know where they are in the photo. Any one know any other names or have any information on this school? 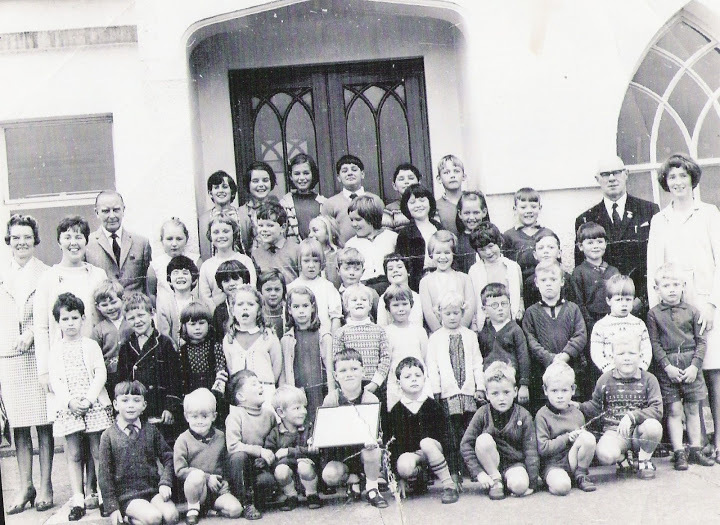 This lovely old school photo was kindly sent by Irene Watson. 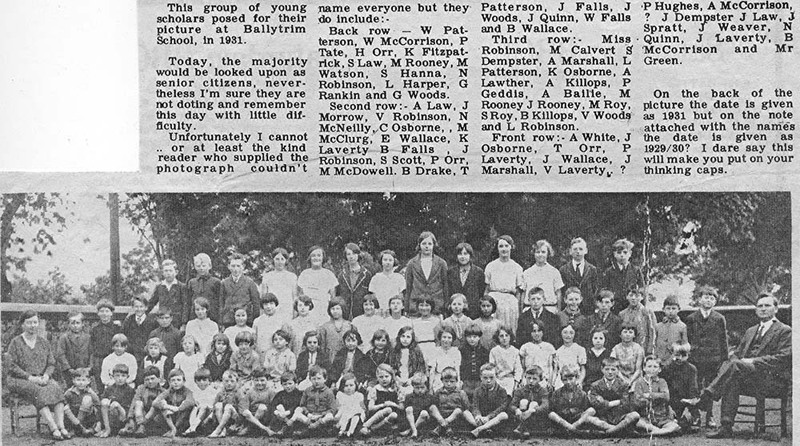 It was originally published in the Down Recorder. This photo was kindly sent by Jim Dickson. it shows his father James Dickson born in 1920. 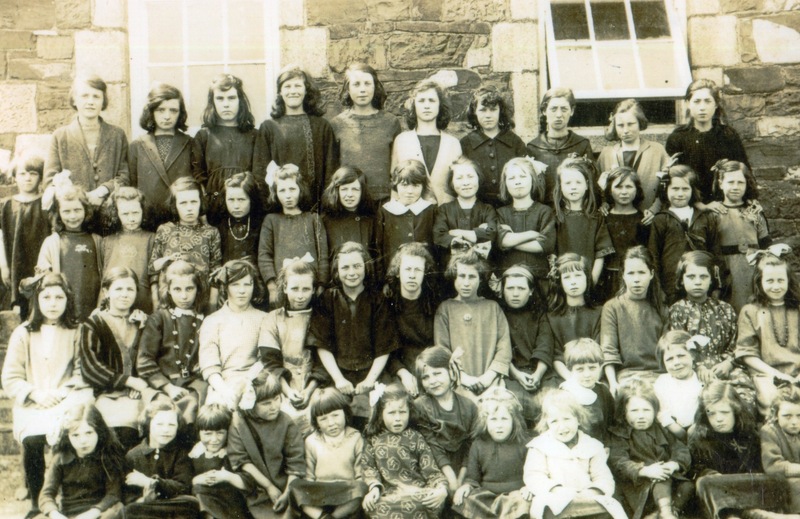 This school started in 1832 in a small cottage near the Catholic chapel. It's income of £8 per year was from the National Board with £12 a year contributed from the pupils. It taught intellectual & moral education using the Authorised Version of the Scriptures & was visited by Rev. Edmund McGinness, parish priest. In 1836 , there were 76 males & 45 females with 27 Presbyterians & 94 Catholics. The master was Terence O'Reilly, a Catholic . 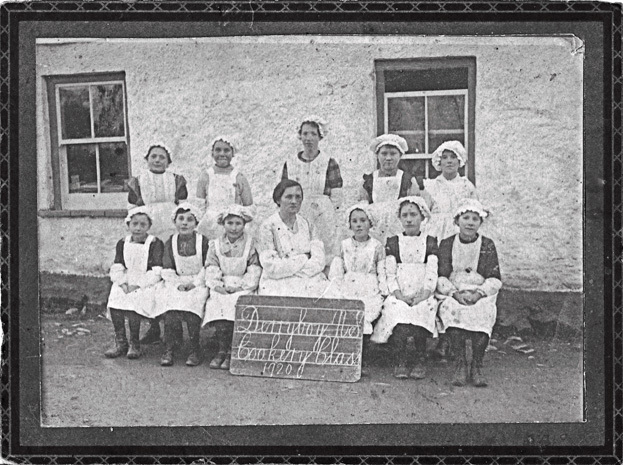 The head master in 1910 was Francis Armstrong with headmistress Mrs. Armstrong & assistant teacher Miss Fealy. Joseph McStay, Stephen Toman, Donald Crangle, John J Monaghan, Thomas Cloughley, Dom Geoghegan, Robert Teggart, Benedict Duffy, Patsy Feeney, Charles Monaghan, Eddie McStay. Joseph (Josie) Monaghan, John T McCaffrey, Willie (Billy) Crangle, Anthony (Tony) McCaffrey, Jack McGarry, Pat Montague, Anthony Magee, Joe Quinn, Con Murphy, Jim Conlon,Joe Thompson, Hugh Coulter. Arthur (Arty) Feeney, Sammy Kerr, Jack Geddis, Gabriel Conlon, Thomas (Tommy) Curran, Eddie (Sonny) Geoghegan, Arthur Crothers, Maynard Hudson, Desmond (Dessie) McAleenan, Jim McGarry. This lovely old photo was kindly sent by Jessie Taylor. Front Row ; Brian Murphy, Elizabeth Scott, Jessie Woods, Jackie Rodgers, James Rodgers, John Gardner. Female pupils with same surnames are sisters and the males with same surnames are brothers. 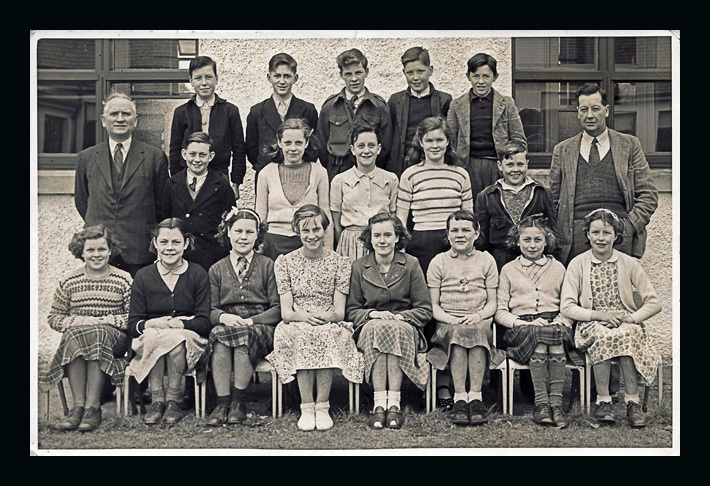 Maggie Morgan, Lizzie Doran, Minnie Morgan, Lizzie Rooney, Maggie Morgan, Annie McAlinden, Mary Rooney, Rose McNally, Mary Greenan, John McEvoy, Corny McGinnes, Charly Fitzpatrick, James McParland, Jimmy McEvoy, Master Hufy. Mary Ann Travers, Biddy McEvoy, Minnie Morgan (Daniel's), Nelly McComiskey, Nellie Morgan, Kate McEvoy, Minnie Morgan, Kate McEvoy (Jemeny), Maggie McGinn, Pager Morgan, Nat/ Mat Morgan, Patrick Greenan, John Doherty. James McComiskey & Jimmy Doherty (William's). 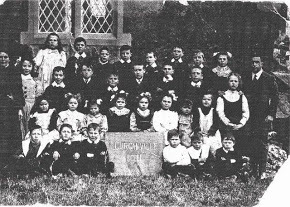 The school was built in 1858 for the children of the estate workers. Click here for a photo of the schoolhouse. Does anyone have expertise in dating old photos from the style of clothing? This lovely old photo was kindly sent by Vernon Moore. 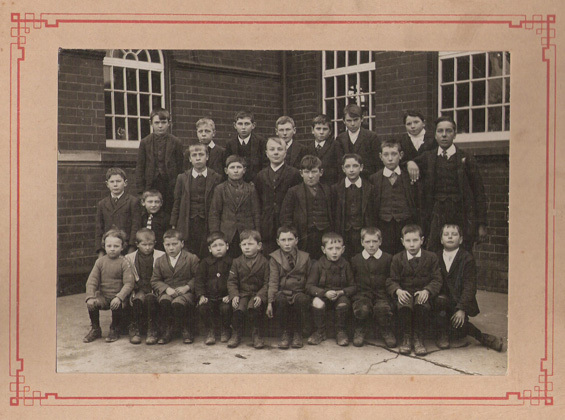 This lovely old school photo c. 1915 was kindly sent by Rev. Angus McCormick. It contains his father. 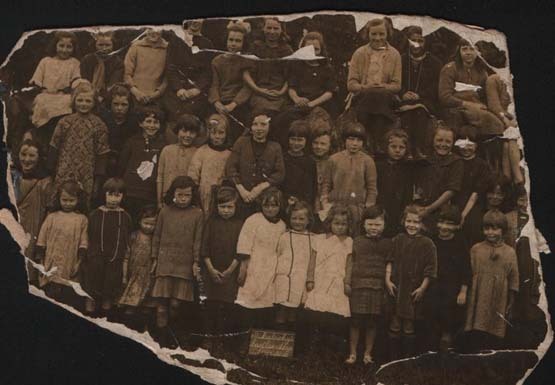 His grandmother, Helena Quinn, is in the front row, first on the left. Does anyone know any other names? This photo was taken in the cloister garden at the Convent; behind the girls are the windows of St. Joseph's Cloister . To the right is the wall of the church . The date is between 1875 & 1880; most possibly 1878. 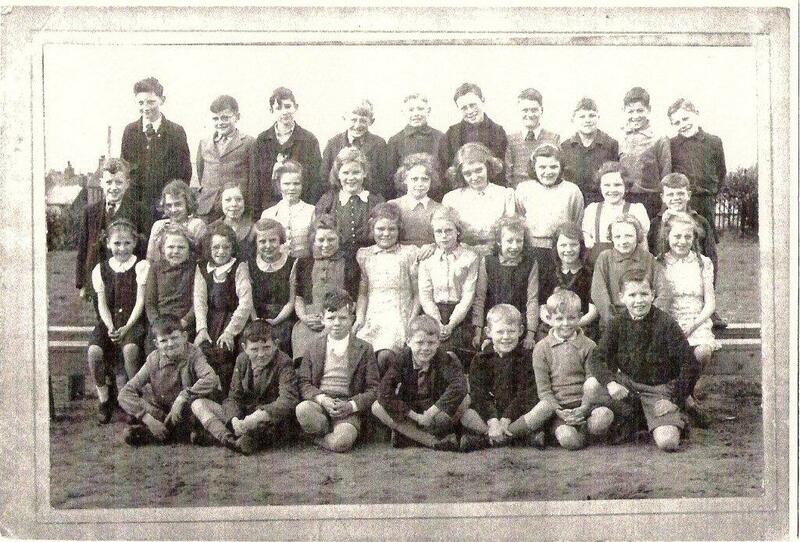 This lovely old photo was kindly sent by Angela Gracey on the occasion of the Feast of Corpus Christi 1930. Her grandfather Malachy Gracey is 3rd from the right and his brother Willie John Gracey is 4th from the right. 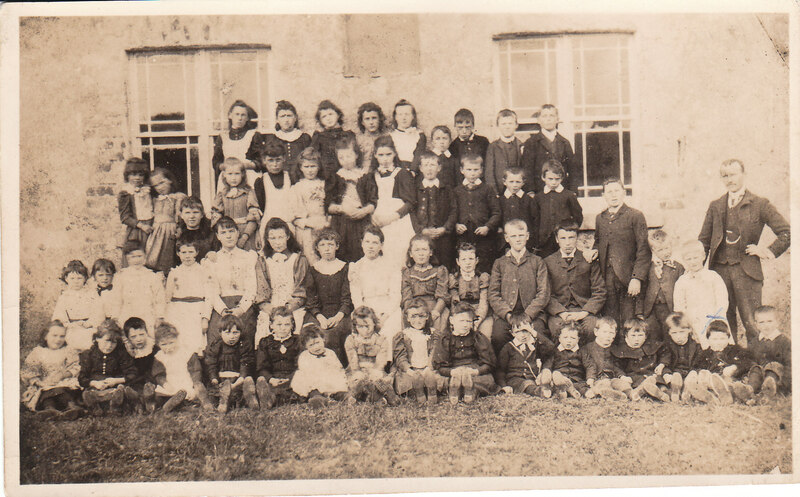 This lovely photo of Dundrum School children in 1922 was kindly sent to me by Sheila Phillips and her Mum (formerly Cissie Cunningham). Hugh Cunningham, Annie Cunningham, Cissie Cunningham, John Grant. Dan Rooney, James Rooney, ?, ?, ?, Joan Crawley, John Campbell, Pat Heenan, ?. Fred Crawley, Jim Doran, ?, ? MCClafferty, Pater Grant. Fourth Row L toR ?, ?, ?, Annie Gilmore, Patsy Cunningham, ?, Joe McGrahan, Cissie Kennedy, Dan McNeal, ?, ?, ?. This photo was kindly sent by Brian Fegan (whose father is featured) & Damian Murdock. 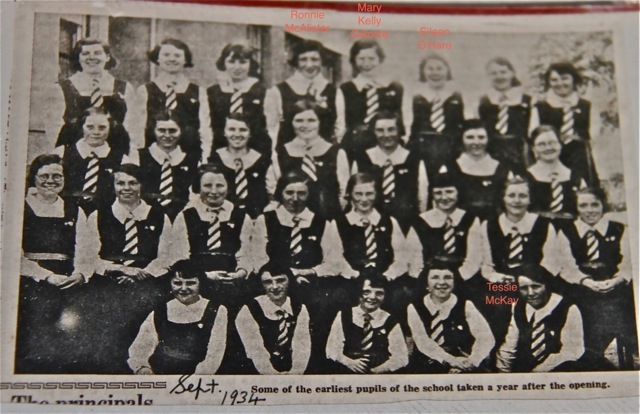 MIDDLE FRONT: Jean Trainor, Katherine Cross, Bernadette Gilchrist, Maria Skeffington, Elizabeth Crangle, Lucinda Crangle, Ann Crangle, ? 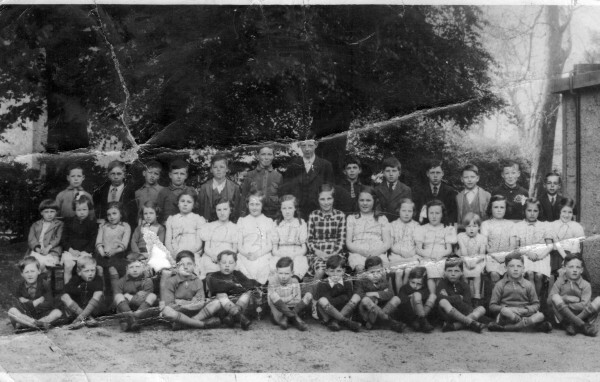 Back row: Barney Cunningham, Barney Kelly, Arthur J Doyle, Arthur Gilmore (Moybrick), Paddy Grant, Mary Kelly, Minnie Arnett, ? ?, Jim Kelly, Pat Morgan (Dannys brother, Walter Hanna, Mick OHare(Derry), ?? The O'Hare children are labelled. Anyone know any other names? Front row: Jim Garret, Seamus O'Hare, Peter O'Hare, Vincent O'Hare, ? ?, Tony McAlister, Danny McKay, Seamus McKay, Seamus McEvoy, ? ?, ??. 2nd row: Desi O'Hare, George Meehan, ? ?, ??, ? ?, Kathleen McKay(Crossgar), Patricia O'Hare, Peggy McAlister, ? 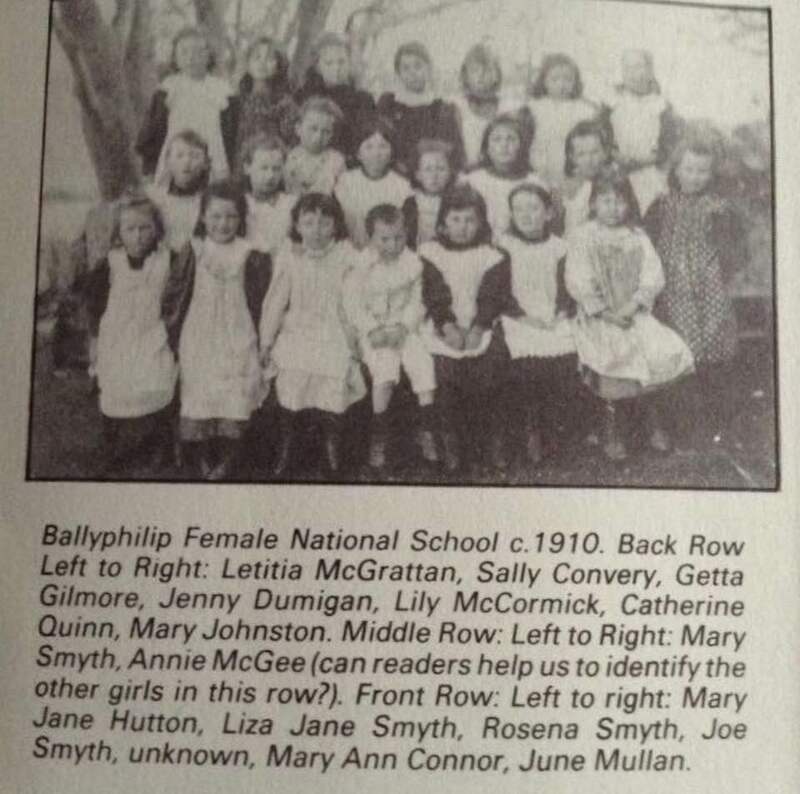 ?, Sally McGrillen, Kathleen McKay(Levallyreagh), ? ?, Margaret Doyle, ? ?, John King, James King. Back row: John O'Hare(Owen), Pat King, Tommy McGuire, John Lundy, ?? 1. Herbie Gibson; 2. Wm. Henry McClenaghan; 3. James McBurnie; 4. ? Sam Snodden; 5. David McClenaghan; 6. ? ; 7. Brian Marks; 8. Harry Finlay; 9. Roy Bolton; 10. Alec Geddis; 11. ? ; 12. Ben Bolton; 13. ? 1. ? Evacuee? ; 2. Alec Geddis; 3. ? ; 4. ? James Cromie; 5. ? Evacuee? ; 6. Brian Marks; 7. Harry Finlay; 8. ? ; 9. Ben Bolton; 10. Roy Bolton; 11. ? 1. Kathleen Gibson; 2. Madge Murphy; 3. Nellie Irvine; 4. Nan Calvert; 5. ? 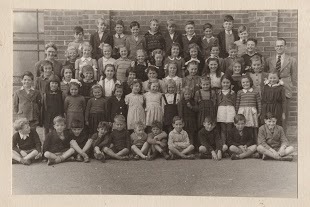 Evacuee; 6. ?;7. ? ; 8. ? These lovely photos were kindly sent by Sandra Gilpin. Her Mum (Sadie McCormick b. 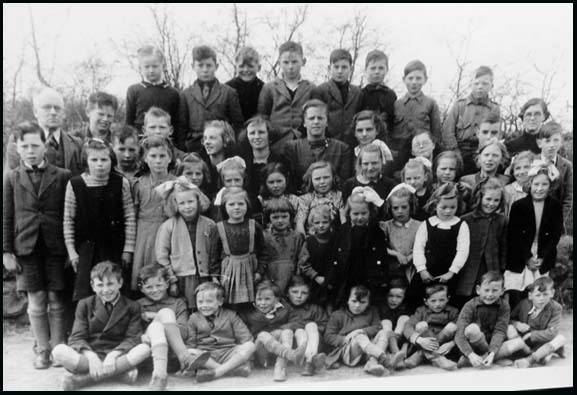 1931 ) is in all the photos and could remember most of the names of the children. 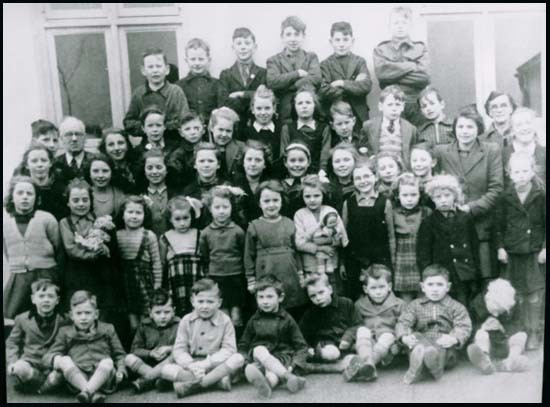 You'll notice that many were evacuees from Belfast because of 2nd World war. If you know the names of the other children. Please email me. 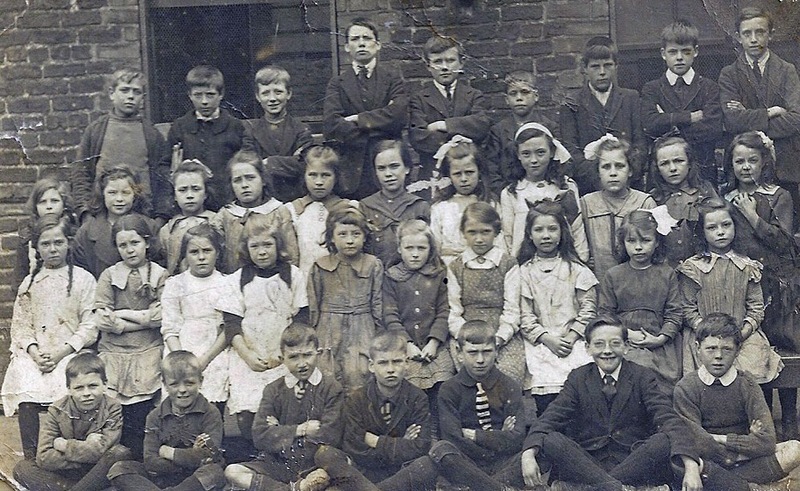 This lovely old photo was kindly sent by Alison Aldersea who was not sure which school it was but the girl who is 4th left, second row from front is Sarah Stewart ( her great aunt) and she lived in Saunders Street off the Newtownards Rd, East Belfast, so likely school there. She was born June 1910 so I put this photo circa 1917/18. 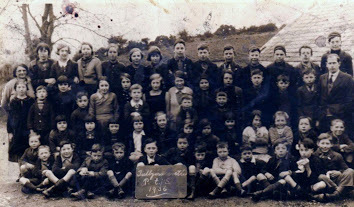 Does anyone recognises any of the children or can verify which school this is? This lovely old photo was kindly sent by Sue McClory . It's of the 1st National School children . 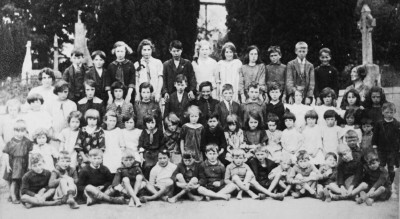 John Byrnes was the teacher in 1910 (POD). 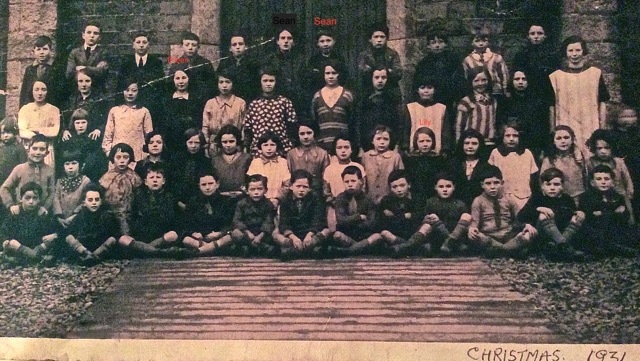 Sue assumes that Peter & Rose McClory's children are pictured but does anyone recognise any other children? 1. Edward Lavery and 2. 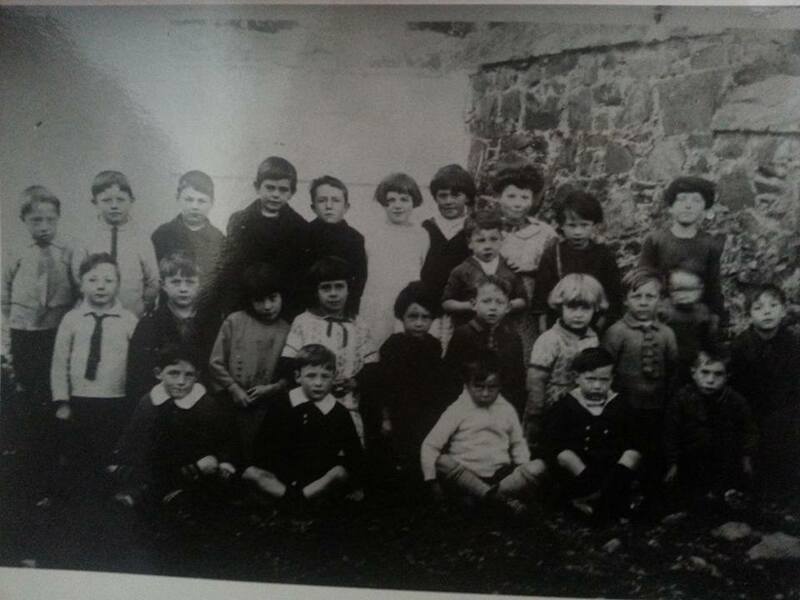 Thomas Lavery (my uncles), 7. Annie Boyle(? ), 8. Emma Lavery Any other names pleaae? 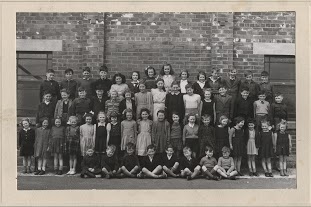 These lovely old school photos of Movilla Public Elementary School (Newtownards) c. 1940s were kindly sent by Gaynor Kane. You can see Scrabo Tower in the background on top of the hill. 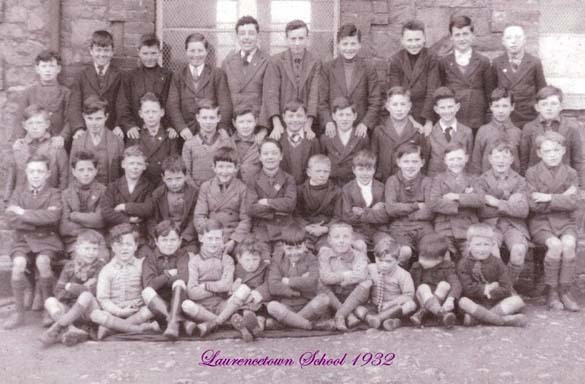 James Robinson has identified his father, Jimmy Robinson of Greenwell St, Newtownards being in the right hand photo- 3rd row, 8th from the left. 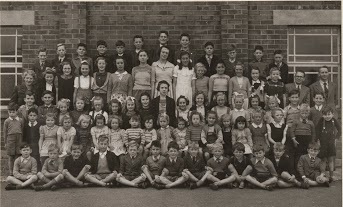 David Hollinger has identified the teacher on the right hand photo as Miss Crawford & the date for the left hand photo as 1944/45. David Hollinger & Norah McMilling Connelly have kindly sent the names for the left photo;Left to right. Third row; A. Davidson, N. McBlain, J. McBlain, A. Conway, I. Clegg, M. McCaw, E. Moorehead, A. Murphy, I. McCullough, A. McGilton, J. Hanna, J. Stevens. Front row; B .Findlay, H. Johnston, B. Atchinson, W. Stevenson, A. McDowell, I. Magill ,G. McConnell. H. Hamilton, J. Gray, E. Dynes, J. Adams, E. Ledgerwood ,G. McGimpsey, R. Crothers, J. Gregory , J Gunning, J Whitla. D .McGilton, M. Chambers, J. Sheilds, M. Clarke, E. Canmore , L. McNultey, unkown ,unkown, E. Miller, F. Whiteside. E. Garrett, S. Paden, M. Carser , M. McCutcheon ,J. Warden, Q. McCready, ? Magill, A. McKee, B. McDonald, E. Brown, B. McGowan. J. Read , E. Harvey, W. McNeilly, C. Cardy, D. Hollinger, J. Brady, S. McCambley. 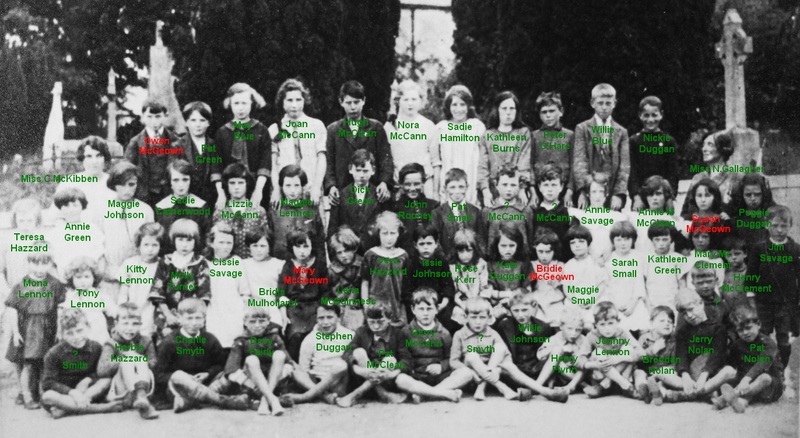 Does anyone know any of the children's names? The Academy school, at the western end of the town was established in 1823 by Mr Price under the direction of John McBirnie. It cost £70; and was half from subscriptions & half from Kildare Place Society It was described in 1836 as a plain, oblong building, whitewashed & slate roofed with a small playground attached and 4 acres given free from Mr Price. The 1st principal was Rev. James Phillips of Glasgow who taught Hebrew, Greek, Latin, mathematics, English & writing. The income in 1836 from pupils was £90 a year and intellectual & moral education, classics, arithmetic, reading, writing, geography were taught . In 1836 there were 42 males & 8 females, a few Protestants ( Anglicans) with Presbyterians in the majority and 5 Catholics. in 1836, the master was Alexander Calewell (Church of Ireland) . 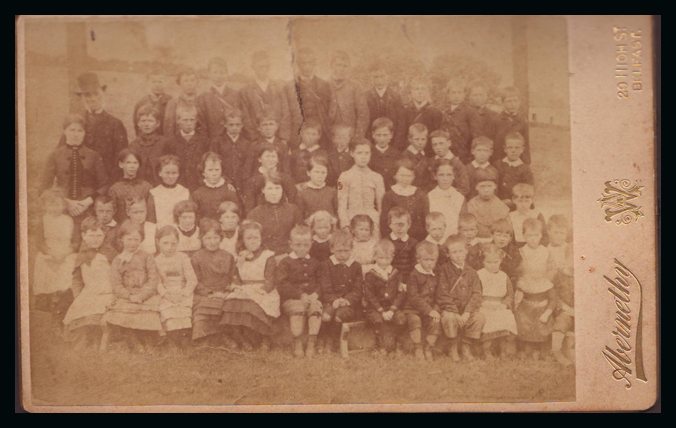 These lovely old school photos of St. Malachy's Elementary School in Castlewellan were kindly sent by Damien Rogan. 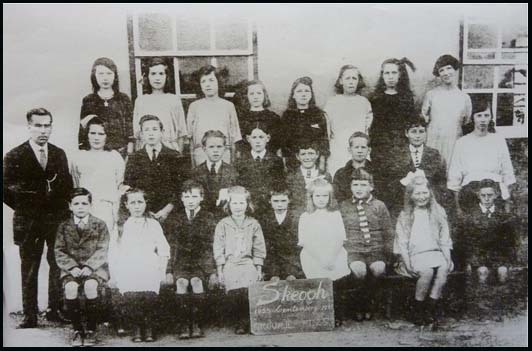 In the photo below (c. 1926) we have Damien's wife's aunt Jenny McArdle ( on the end of the right front row ) The teacher is Mrs. Nangle. Anyone know any other names? This photo was kindly sent by Cahill Hamill . 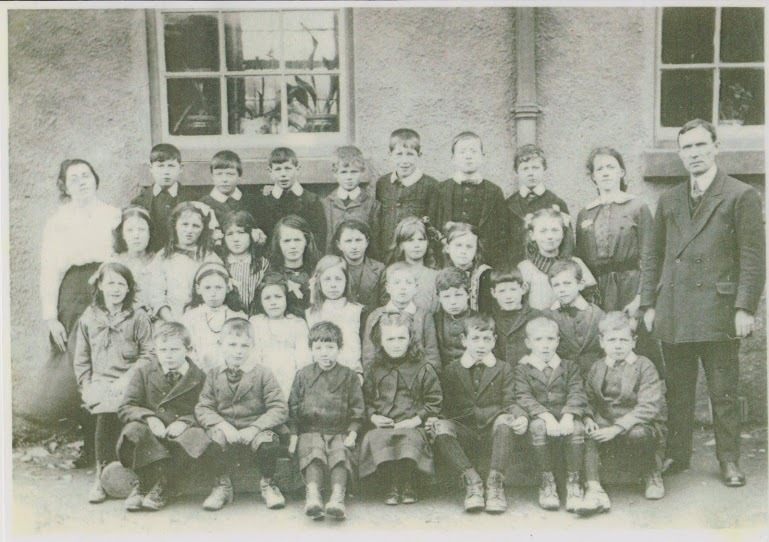 It shows his grandfather Patrick Hamill who lived at Ballintogher with his class approx 1912 to 1915 but were're not too sure which school near Saul it's from. The master was Mr Smith who lived at the school house which is the next house past St.Patricks chapel heading towards Raholp. 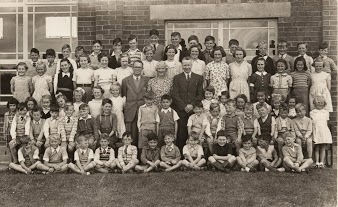 Please mail me if you recognise anyone or can tell us which school it was. 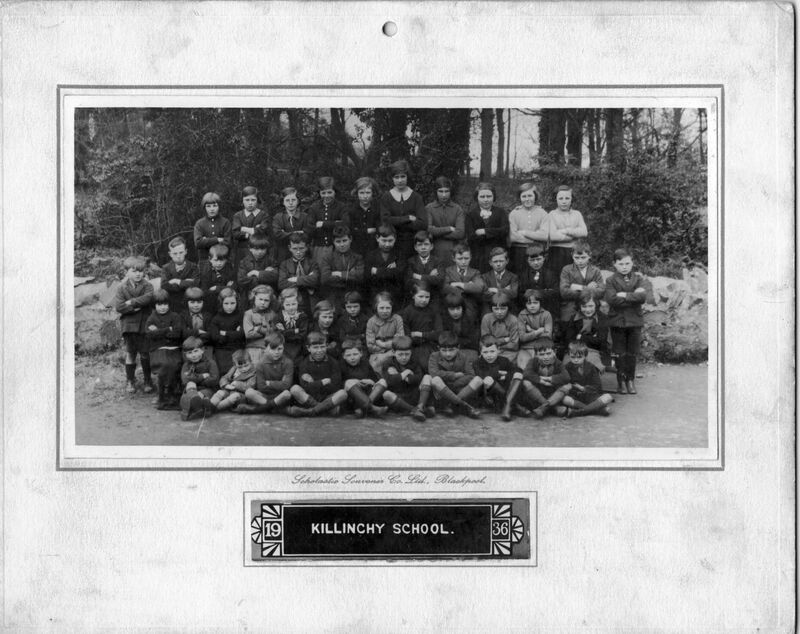 These photos were kindly sent to me by Florence Chambers whose father , William John Dickson, was school principal from 1916. This photo was kindly sent by Jim Dickson. 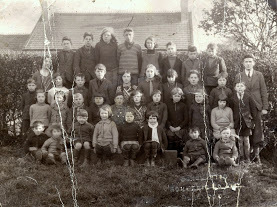 It shows his mother, Isobell Knox who was born in 1925 .
click here for a list of other class photos that I can email.